My images are digitally manipulated composites built from photographs I find online. The technique I use could be considered “hyper-collage”. I cobble together pieces from photos I find interesting and feed them into Photoshop. Through a palimpsest-like layering process of adding and subtracting, I gradually blend the various parts together. I am basically manipulating and assembling a disparate array of multiple photographic elements (sometimes more than 50) to produce a single homogenized image. I do not use a camera at any stage in the process. 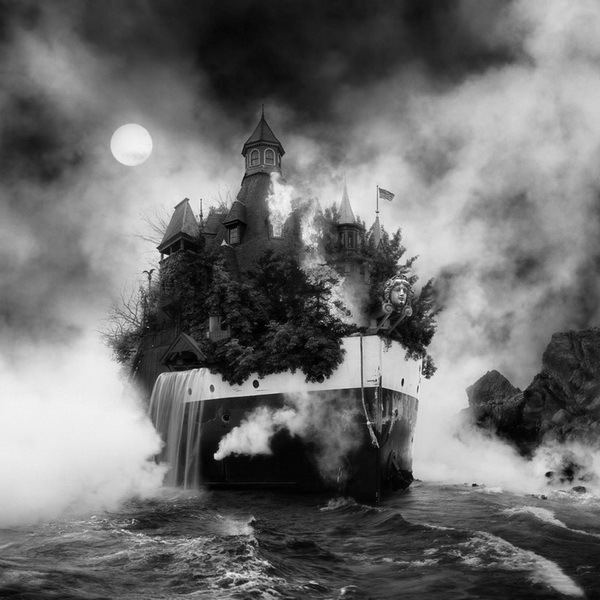 Jim Kazanjian received his MFA from the Art Center College of Design in 1992. His BFA was completed at the Kansas City Art Institute in 1990. 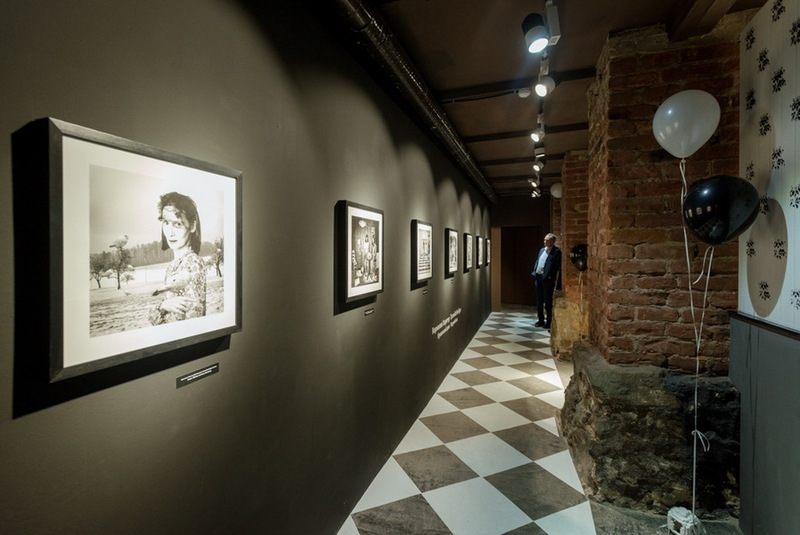 Jim's photographs have been exhibited across North America, Europe and Australia and featured in numerous publications including Esquire, The Atlantic, and Daily Mail. His work is in the collections of the Bibliothèque Nationale de France, the Ackland Art Museum and others. He currently lives in Portland, Oregon. As a small child growing up in Switzerland, I was fortunate that my parents introduced me to museum collections and exhibitions. They would often take me to openings by local artists. After dinner, my father would go into his studio where he would spend hours painting. My parents had a deep appreciation for the complex power of artistic production and that appreciation, along with their profound love and passion for all of the arts, carried over to me. I was also very lucky to have a grandmother who would spend hours telling me stories and traditional fairy tales, further nourishing my imagination and allowing me to leave the space of reality and gain access to a more magical world. Eventually, I would find myself able to find the magical within the real world. Space, and how we arrange things within that space, has been fascinating to me all my life. My work very much deals with space and how the body, especially as present in self-portraiture, occupies space and moves within a spatial environment. The relationship between space, object, and subject is what fascinates me most. The Doppelgänger series of photographs are pictorial narratives that explore internal human emotions, notions of the uncanny, the subconscious/conscious mind, the ego and the alter ego. The narrative structure itself is based upon and utilizes the concept of the Doppelgänger—specifically as understood within Germanic literature. In this context, the notion of the Doppelganger is understood as a ghostly double or apparition of a living person, widely assumed to be sinister and a harbinger of bad luck, but also highly ambiguous, thus presenting a psychological dilemma. 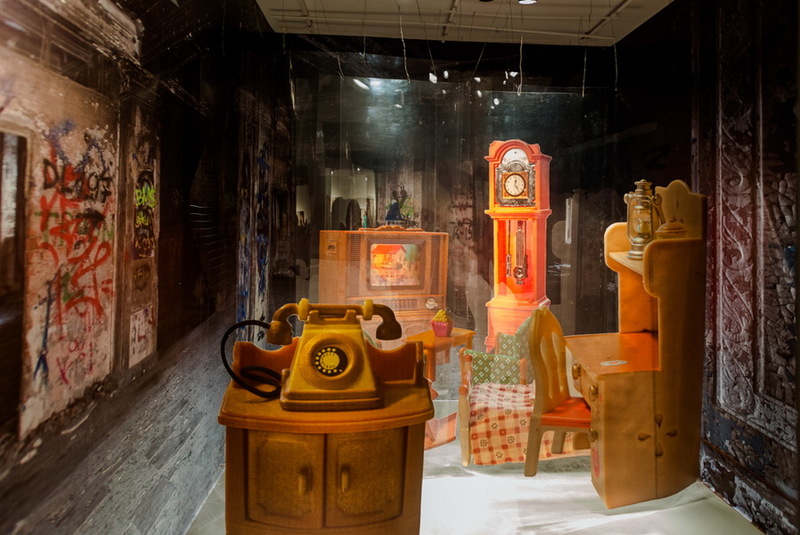 The central characters themselves, are enacted by the artist herself, within claustrophobic and timeless spaces. 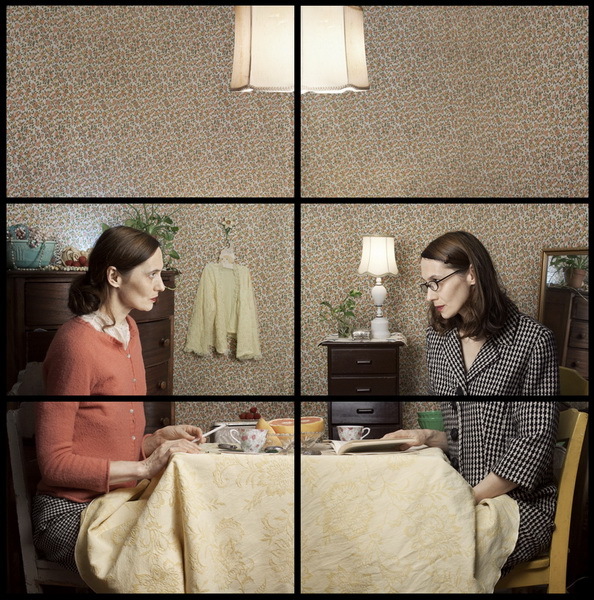 The structural device of the tableaux-vivant is used to carefully choreograph multiple individual, fullframe photographs into single artworks, using a grid system that also serves to maintain the photographic integrity of each photograph. 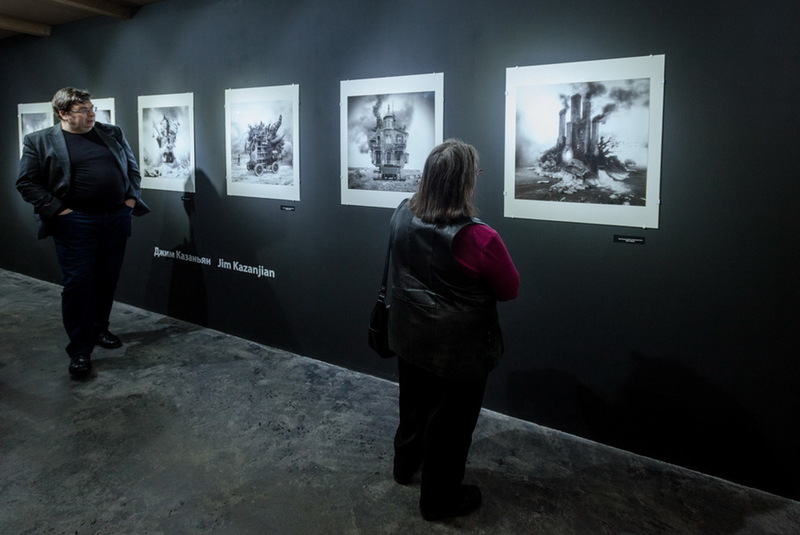 Most of the artworks are constructed with six photographs, but as the series has progressed they have developed in complexity, incorporating up to eighteen photographs. The more recent artworks have progressed in their storytelling, moving beyond the grid itself and making use of the diptych and triptych format. 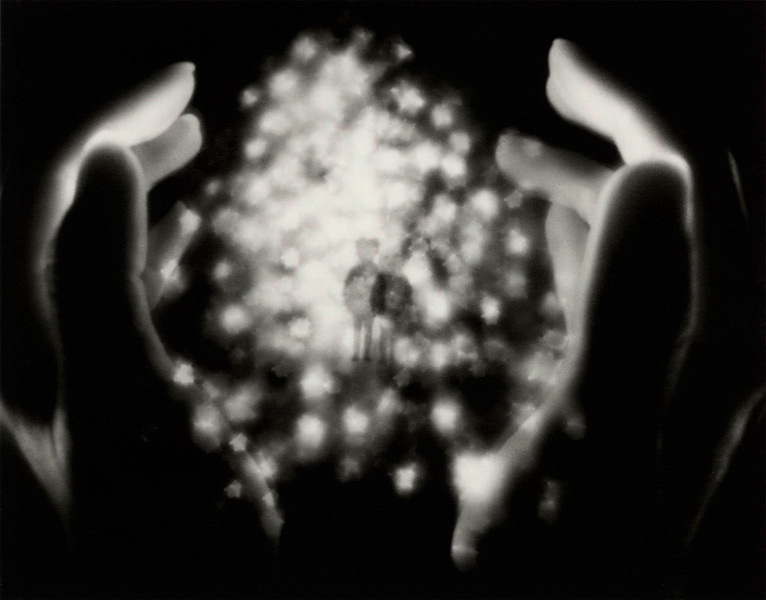 The hand of the artist is up front and center across the Puppenhaus series – pencil marks, irregular cuts left exposed, paint, hanging strings, and individual elements attached in low relief, which together draw attention to the unusual focal planes, angles of view and shifts in scale. 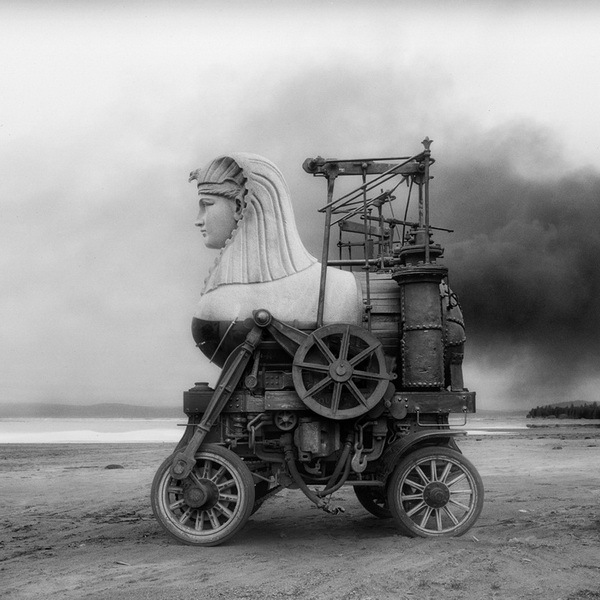 All of this combines perfectly with the seemingly whimsical narratives that take the viewer on a journey through the artist’s fictionalized world. 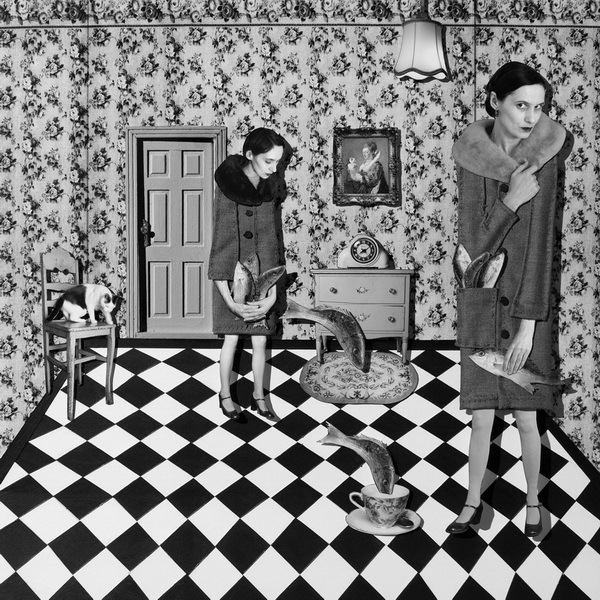 The use of self-portraiture prevails, linking this series back to the previous Doppelgänger work. Cornelia Hediger is a Swiss artist living and working in New York. Awards and honors include being named a PDN’s 30 Emerging Photographers to Watch (2009), PX3 Prix De La Photographie Paris, 3rd in Art Photography other (2010) and more recently she was selected by Erik Kessels for the FOAM “What’s Next” online search for the future of photography debate. 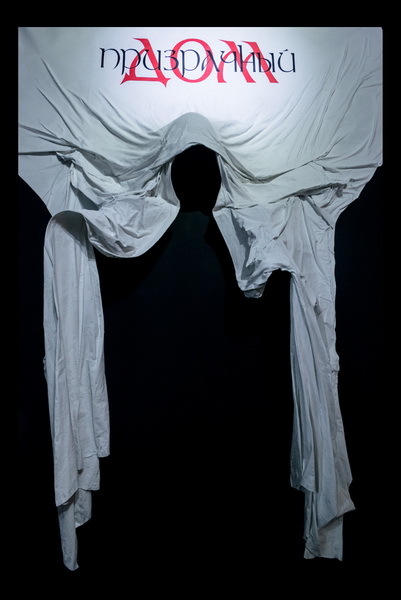 Hediger’s work has been exhibited in solo shows at Klompching Gallery, New York (2008, 2011, 2016), The Center for Photography at Woodstock, NY (2008) and has also been exhibited in several group exhibitions in Berlin, Chicago, New York, Seattle, Arles (France). Her work has been reviewed and featured in a number of publications including The Wall Street Journal (2011), Visura Magazine (2009), New York Magazine (2008). Cornelia Hediger’s work can be found in several private collections in the US, Japan, Switzerland, Italy, Germany, Autstria and the United Kingdom. At times in my day-to-day life, I find myself stumbling over reminders of days gone by. Partly formed of memory rise up from a forgotten abyss within, surrounding me like a powerful fragrance and rocking my emotions to the core. In these moments, I am seized with the desire to gather and collect, to retrieve what has been lost and weave it into something whole. I spent my childhood in a small village in the mountains of Japan. As a child, I ached to leave my home, to become an adult and discover the person I truly was. I dreamed of taking myself to a place where I was known by no one, where I could sing and dance to my heart’s content without interruption. Now that I am no longer a child, it has occurred to me how this desire has led me to abandon traces of my past, effectively unmarking myself with the scent of my own recollection. My aim with this project is to reconstruct the half-remembered memories of my childhood based on clues from the emotional elements associate with my childhood memories, as well as the symbols that exist in photographs I keep as mementos. Three-dimensional dioramas, composed of overlapping multiple layers of photo collages, have been assembled and photographed to illustrate landscapes of my memory. Ayumi Tanaka is a Japanese-born artist, living and working in New York City. Tanaka has been working on photography project by using found images from private snapshot and the Internet to explore theme of memories. She received a BFA from Osaka University of Arts in Japan in 2003 and studied at International Center of Photography in 2010. 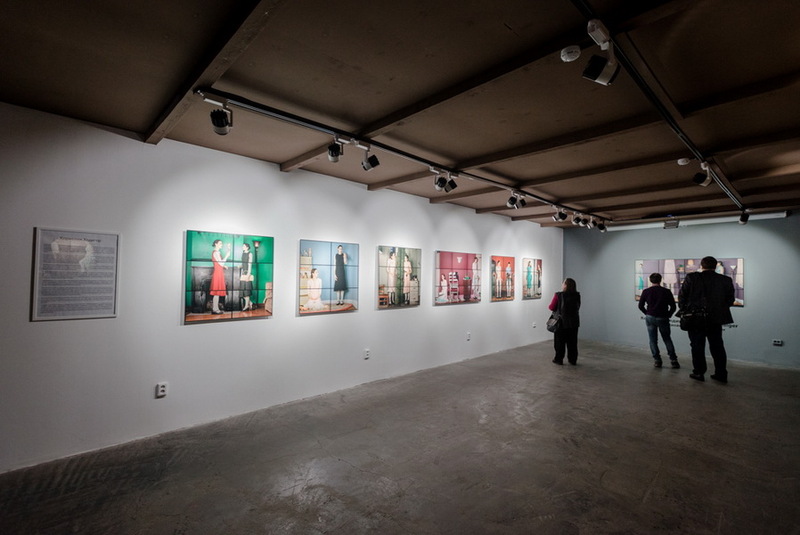 Her work has been shown internationally at exhibitions including United Photo Industries Gallery in New York, Tokyo Institute of Photography in Tokyo Japan, 25 CPW Gallery in New York, Pictura Gallery, Dumbo Arts Festival 2011, LOOK3 festival of the Photographs 2012 and Athens Photo Festival 2015. 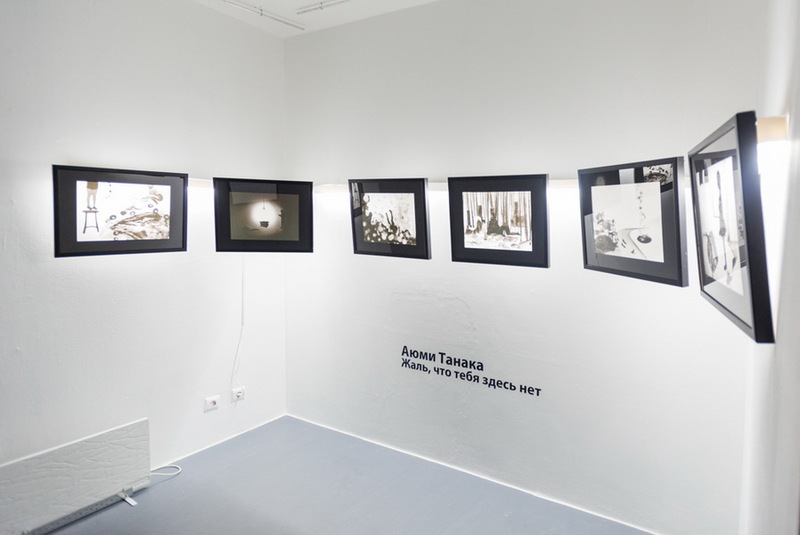 Tanaka’s work recently included in “Universal Nature Rediscovery of Kalevala” at Sezon Arts Gallery in Tokyo (supported by Embassy of Finland and Finish Institute of Japan and Kalevala Institute) and “Photography Now 2017” at The Center for Photography at Woodstock selected by William Ewing. 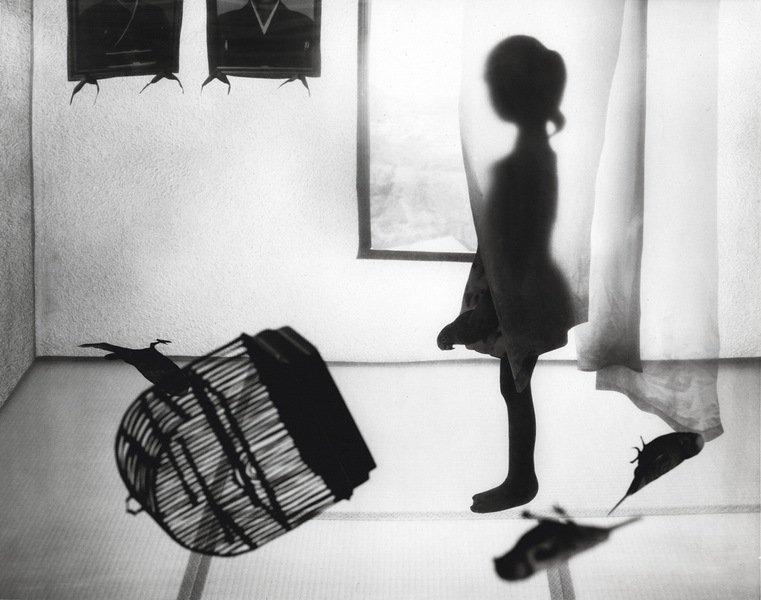 Tanaka has been received International Center of Photography Director Fellowship in 2010, Grand prix at Tokyo International Photography Competition 2013 (Tokyo, New York), Photolucida Critical Mass Top 50, Feature Shoot Emerging Photography Award 2014, PDN’s 30 New and Emerging Photographer to watch 2016 and New York Art Foundation Fellowship 2016. Denis Tarasov’s installation “Comfort Zone” can be interpreted as a metaphor for illusory prosperity in the ocean of time. 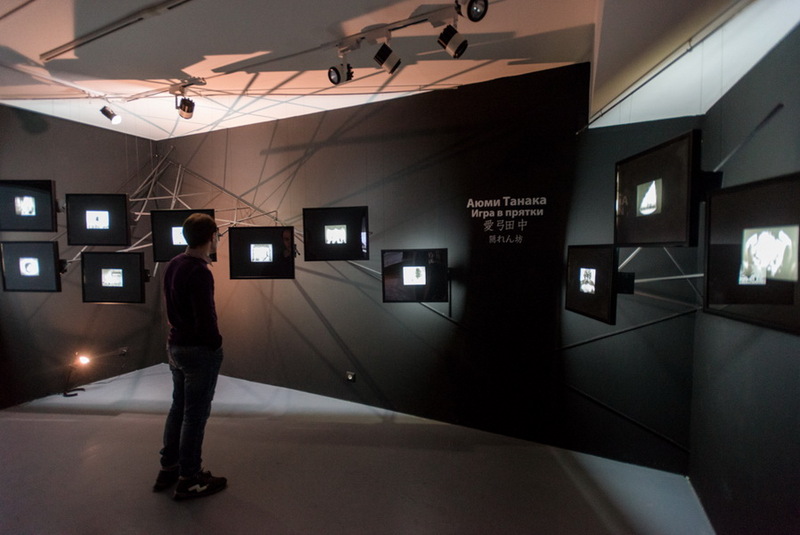 It is easy to notice the connection of this work with other parts of the exhibition. There is an abandoned dying house by Jim Kazanjian, toy world by Cornelia Hediger, and a reference to childhood images by Ayumi Tanaka. The word “zone” has two meanings in the Russian language. We can use it either as a neutral term indicating some allocated space (for example - "luggage inspection zone"), or as a negative word, meaning “prison” or any territory that is alienated from normal life. In the Strugatsky brothers’ novel "Roadside Picnic" the Zone is a place full of all kinds of dangerous paranormal phenomena, but in its heart there is the place where wishes are fulfilled. Andrei Tarkovsky in his "Stalker" (movie based on the Strugatsky brothers’ novel) used shooting of abandoned buildings, crumbling walls and forsaken objects as the visual representation of the Zone. In this movie the Zone has become a symbol of time and of being doomed to oblivion. The artificial world that human beings create around themselves is called civilization and culture. Centuries later it will all turn into ruins, likewise the ancient monuments nowadays. But since man lives not only the reality, but also the dream, this illusionary toy island stays with him always.